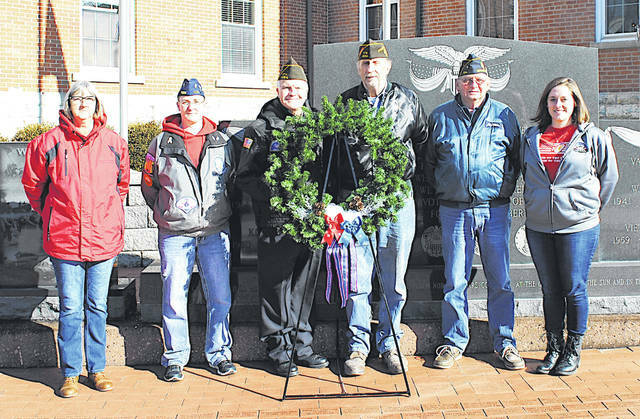 Six representatives from local veterans organizations placed a wreath Friday at the Highland County Veterans Memorial on the courthouse lawn in Hillsboro in recognition of the 77th anniversary of the Japanese attack on Pearl Harbor. Pictured, from left, are Becky Williams and Stephanie Roland representing the Highland County Veterans Service Office, Hillsboro VFW Auxiliary and Support Our Troops Of Highland County; David Pinney with the Highland County Veterans Honor Guard; Hillsboro VFW Post 9094 Commander Rick Wilkin; John Walker representing Mowrystown American Legion Post 694; and Cailin Hoskins with the Highland County Veterans Service Office. On the 77th anniversary of the day more than 2,400 people died in an attack on Pearl Harbor, representatives of local veterans organizations placed a wreath memorializing the day in front of the Highland County Veterans Memorial on the courthouse lawn in Hillsboro. On the ground in front of the memorial are brick pavers with the names of approximately 1,500 local veterans and service members etched onto them. The three marked bricks closest to the memorial have the names of Donald W. Caplinger of Concord Township, and John A. Smith and Woodrow Wilson, both of Greenfield, etched on them. They were Highland County’s first casualties in World War II and were all aboard the USS Arizona when it was attacked in Pearl Habor, according to Hillsboro VFW Post 9094 Commander Rick Wilkin. He said he believes two of three died aboard the Arizona, while one of them made it home and died later. But pearl-habor.com lists all three as casualties. Wilkin said the county’s various veterans service organizations try to place a wreath at the memorial every year on Dec. 7, the day Japan attacked the harbor at 7:55 a.m. in 1941. “It’s to remember those who gave their life on that day, which was the start of World War II for the United States,” Wilkin said. “It’s nice to keep reminding the public that there’s certain dates that need to always be remembered,” added a member of the Highland County Veterans Service Office who asked not to be identified. The memorial at the courthouse was dedicated on May 28, 2012. Each year, shortly before Memorial Day, new bricks with the names of local veterans and current service members are added to the memorial. The bricks cost $50 and can hold three lines of lettering with up to 20 characters on each line. Wilkin said bricks need to be ordered by the end of March to have them placed at the memorial this year. Order forms are available at the Hillsboro VFW Post behind the Dairy Queen in Hillsboro, Rick’s Body Shop at 2955 U.S. Route 50 in Allensburg, or the local Veterans Service Office at 1575 N. High St., Suite 400, Hillsboro. The Veterans Service Office is also selling military banners like the ones that were on light posts in the uptown Hillsboro for several months this year before recently being removed. Last year there were 120 banners honoring local veterans or service members, plus 10 more banners recognizing sponsors of the project. The VSO said 115 banners have already been sold for next year. The banners are $50 annually. If someone orders one, they can also order a smaller garden or yard size banner for $25. The new banners will likely go up around mid May and remain up for about six months, the VSO said. It said the plan is to keep the project going for years to come. It also said if it receives more orders than it has spaces for banners, those not placed this year will be placed on a first-come, first-served basis the following year. Banners from last year that have not been picked up are available at the Veterans Service Office. Adm. Phil Davidson, commander of the U.S. Indo-Pacific Command, said the nation can never forget the heavy price paid on that day. He cited 21 vessels damaged or sunk, 170 planes destroyed, and more than 2,400 people dead, including servicemen and civilians.